2015 has arrived, and with it comes my One Word for this year: ENOUGH. Last year was a year of enormous growth for me. Actually, the past two years have been pretty monumental years in terms of personal growth. I am more comfortable in my own skin than I have ever been, and I have finally begun to live free from the weight of others’ expectations of me. That said, privately I have really struggled with never believing that I am good enough. Though I believe in myself more than I ever have, there is constantly this little nagging feeling that if only I could do and be more, then my life would be perfect. If only I could lose weight, or be more confident, or do more crafts with my kids, or cook more gourmet meals, or be more selfless, or take more me time, or be more creative at work, or call my friends more often, or get published in this journal or on that website, or be more spiritual, or be less spiritual, or stay up later, or get up earlier . . . . the list is never-ending. Brene Brown has blown the top off of vulnerability, and her book Daring Greatly is an important one in my life. This year, I am borrowing from her incredible work that tells us that we can let go of the myth of scarcity, the myth of never enough. While I am definitely pro self-improvement and personal growth, what I am looking for this year is the freedom to rest in the knowledge that who I am is enough. I don’t have to bend over backwards to make everyone happy or berate myself for not being perfect in every way. I am enough for God, I am enough for my family, I am enough for my friends, and most importantly (because despite how many people encourage me, I never can seem to believe it) I am enough for me. My mind is enough. My thoughts are intelligent and my opinions matter. I don’t have to be smarter or louder to make people like me. I don’t have to convince others of my beliefs in order to be worthy of their friendship or respect. I can be open to learning, but I don’t have to diminish or apologize for my own thoughts in order to be accepted. My body is enough. I do not have to torture myself to get a body that someone somewhere said is the perfect one. This body is beloved by my husband. This body grew and fed two children. This face is welcomed and valued. These hands work in many different ways to bless the people I love. These feet carry me to places where I constantly find opportunities to be helpful, creative, and loving. I am beautifully made, and that is enough. My motherhood is enough. My children know that I love them unconditionally. They know that our home is a place of acceptance, learning, openness, and grace. They know that when I tell them no or get onto them, I am doing it to either keep them safe or to help them learn how to be good people. They also know I am imperfect and make mistakes, and they forgive me when I apologize. My writing is enough. It is beautiful and life-giving, and I don’t have to wait for some editor to tell me that in order to believe it. I don’t have to have published widely or to have made a bunch of money or to write like anyone else to believe that my writing has been and will continue to be a blessing, both to me and to others. My writing is a way for me to pour my voice into the world, and that voice is enough. My ESL knowledge is enough. I have years of ESL teaching experience in a variety of different grade levels, and it is okay for me to claim that. I am in a position where I often find myself on the periphery, and sometimes people think I don’t do much and am not worth much. But I can believe that in my job, I am enough, and I can be confident in my skills. The teachers I work with know that I will willingly admit when I don’t know something and I will try to find the answer. They also know that I will do my best to find the resources they need and that I will keep the education of ESL students in the forefront of their thinking. They know that I will look for the good in them and I will speak up for the ESL students. My beliefs are enough. My faith, or my lack of it, doesn’t render me a worthless person. I am authentically seeking answers to some really deep questions about God and the Christian faith, and often I am discovering that those answers lie in dark places where it’s easy for me to feel isolated and judged. Perhaps that isolation and judgment have been self-imposed, but now I release myself from them. My struggles with belief do not make me a sinful person. I am holding my mustard seed, and it is enough. I am not attempting to be prideful, condescending, haughty, or holier-than-thou. I have spent years trying to be a humble person, and I wholeheartedly believe in the power and value of humility. But somewhere along the line, that humility turned into self-hatred and never feeling adequate. This is not my year to be better than. This is my year to believe that if I am created in image of God, I am beloved. I matter. I am enough. I am linking up again this year with One Word 365. Check out the site to see other people’s words for 2015 and add your own! SO MUCH YES! In fact, I am printing this manifesto and sticking it on the wall at my desk so I can look at it everyday. Thank you, friend! Can’t wait to see you grow in this this year. Thanks, Lily. It’s pretty sweet when someone wants to see your words every day. 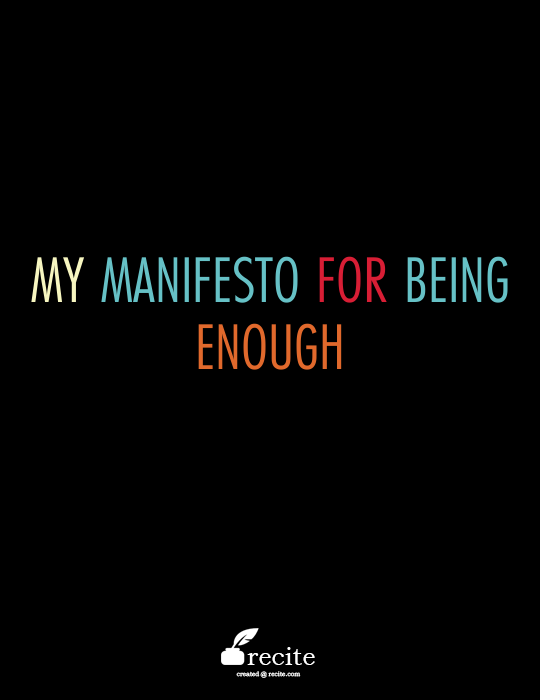 That said, it might be a powerful exercise to write your own manifesto for being enough. I mean, feel free to steal lines from mine, but you could tailor it to your own life and feelings. Yeah, I think enough probably should have come before grow, but whatever! I’m going with it. Krissa, yes, you are enough. I just read your much earlier Nazbeen post and comments. I am also one of that tribe. Thank you for the gracious way you responded to so many at different stages of awareness. I’m taking the liberty to suggest a way I see dots connected between that post and this one. A theme of the Nazbeen post was the “guilt” that legalistic systems create – and they do. At it’s root, legalism is an attempt to manipulate an negative image of God. It creates a conformity culture by using shame that creates heart-wounds that we often identify as guilt. Shame is a complex and paradoxical experience. Calling it “guilt” makes it more difficult to find healing, in part, because guilt implies the need for forgiveness. We wind up praying something like “God, forgive me for not being ______ enough. Forgive me for being me.” Another complexity is calling the experience “false guilt” – that simply adds shame to shame since what is experienced does not even exist. Long story short: The degree we’ve internalized shame is the degree to which we will struggle to internalize grace. Your journey in Orthodoxy includes a paradigm shift of sin from a legal concept to one of sickness/illness and the healing it’s creating for you is grace for the shame. Paul, thanks for these connections. I think you’ve made such great points about shame and grace here.